Color-change technology makes sealant application easier than ever. This low viscosity, fluoride-rel..
Copaliner® protects the dentin and penetrates, fills, and seals the tubuli. It insulates against the.. 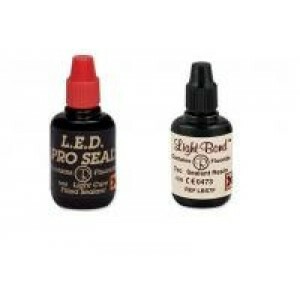 Available With or Without Fluoride - Light Bond™ :Paste and Sealant are formulated with a patented m..
Bis-GMA based filled sealant resin is formulated specifically for the sealing of small pits and fiss..
Self-etching, light-cured pit and fissure sealant with excellent bond stregth for lost lasting place..
Chemical Cure Pit & Fissure KitProduct Name: Chemical CureManufacturer: Prime DentalDispensing Syste..
Fluoride releasing, light cure sealant.Syringes3mlProduct NameSeal-Rite Pit & FissureManufacturerPul..
Fluoride Releasing Pit and Fissure Sealant System with no phosphoric acid required. Ideal handling &..
Bonds to the moist tooth. Seals against microleakage. Margins are undetectable. Contains No BPA, No ..